Location: Level 2, No.24, Vittal Mallya Road, Bangalore 560001. Phone: 080 41738800. Timings: 12 noon to 11 p.m.
Ambience: The 142 cover restaurant has an interior and an al fresco seating area that works beautifully in Bangalore’s salubrious weather. The ambience has a fun and peppy feel and a wine rack acts as a separator to the different seating spaces. Done up in hues of black, brown maroon and green the colours contrast the space and a blackboard runs alongside one wall filled with special offers and lots of information on the food. 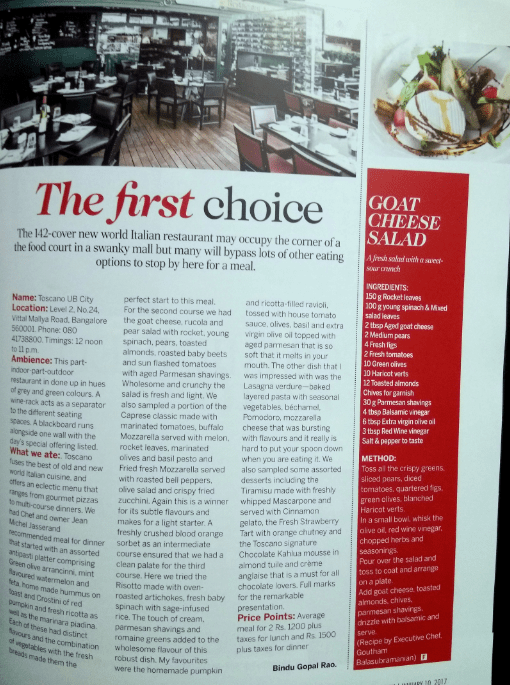 What we ate: Started in 2008, Toscano Restaurant & Wine Bar, under the management of the Red Apple Kitchen Pvt. 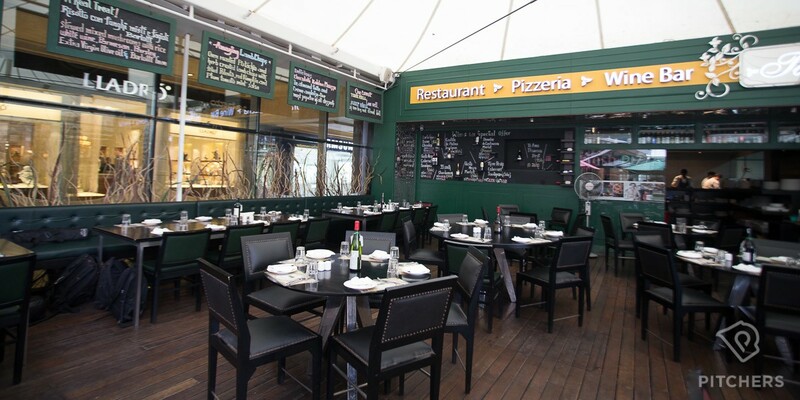 Ltd, is a fine-dining Italian restaurant with branches all across Bangalore. This is the brainchild of Jean Michel Jasserand and Goutham Balasubramanian. At the UB City space, there is an intimate yet vibrant atmosphere. 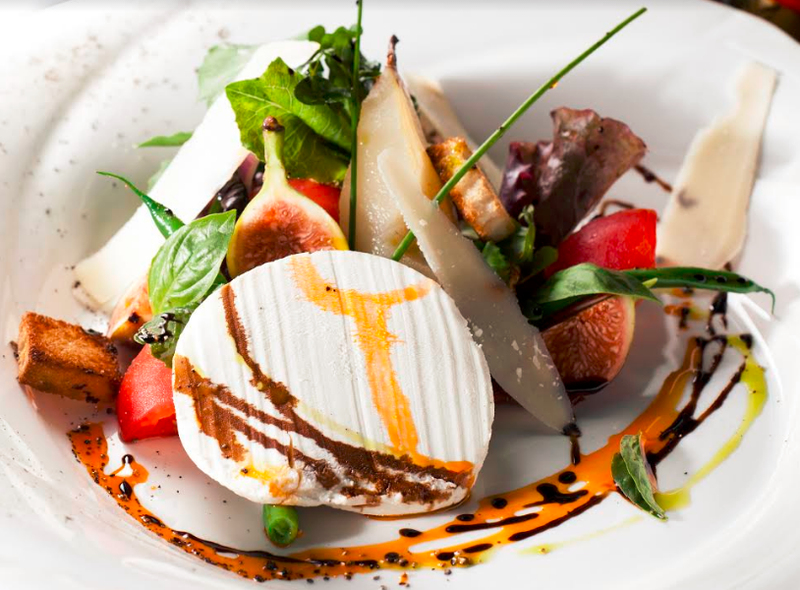 Fusing the best of old and new world Italian cuisine, Toscano offers an eclectic menu from gourmet pizzas to multi-course dinners. We had Chef recommend meal for dinner that started with an assorted antipasti platter that has Green Olive Arrancinni, Mint flavoured watermelon & feta, Home Made Hummus on toast and Crostini of red Pumpkin & fresh Ricotta as well as the Marinara Piadina. Each of these had distinct flavours and the combination of vegetables with the fresh breads made them the perfect start to this meal. For the second course we had the Goat cheese, Rucola & pear salad –rocket, young spinach, pears, toasted almonds, salt roasted baby beet and sun flashed tomatoes with aged Parmesan shavings. Wholesome and crunchy the salad is fresh and light. We also sampled a portion of the Caprese classic made with marinated tomatoes, buffalo Mozzarella served with melon, rocket leaves, marinated olives and basil pesto and fried fresh Mozzarella served with roasted bell peppers, olive salad and crispy fried zucchini. Again this is a winner for its subtle flavours and is a light starter. A freshly crunched blood orange sorbet as an intermediate course ensured that we had a clean palate for the third course. Here we tried the Risotto made with oven roasted artichokes, fresh baby spinach with sage infused rice. The touch of cream, parmesan shavings and romaine greens added to the wholesome flavour of this robust dish. My favourites were the homemade pumpkin & ricotta filled ravioli, tossed with house tomato sauce, olives, basil and extra virgin olive oil topped with aged parmesan that is so soft that it melts in your mouth. The other dish that I was impressed with was the Lasagna verdure—baked layered pasta with seasonal vegetables, béchamel, Pomodoro, mozzarella cheese that was bursting with flavours and it really is hard to put your spoon down when you are eating it. We also sampled some assorted desserts including the Tiramisu made with freshly whipped Mascarpone and served with Cinnamon gelato, the Fresh Strawberry Tart with orange chutney and the Toscano signature Chocolate Kahlua mousse in almond tuile and crème anglaise that is a must for all chocolate lovers. Full marks for the remarkable presentation – that makes you want to eat the plate! An absolute must visit. Toss all the crispy greens, sliced pears, diced tomatoes, quartered figs, green olives, blanched Haricotverts. In a small bowl, whisk the olive oil, red wine vinegar, Chopped Herbs and seasonings. Pour over the salad and toss to coat and arrange on a plate. Add goat cheese, toasted almonds, chives, parmesan shavings, drizzle with balsamic and serve.